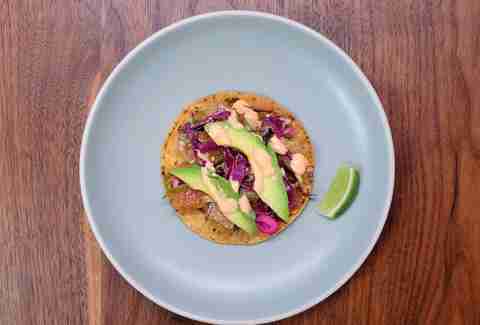 Poke has swum full steam ahead into the San Francisco restaurant scene in 2016. Ten new casual spots serving the delicious Hawaiian staple have opened since the beginning of the year, and several more are on the way -- not to mention the numerous fine-dining restaurants across the city that serve upscale variations of the raw fish dish. But why the sudden poke craze? We took a deep dive into what it is about poke that San Franciscans love so much and the best places to get it. First of all: what is poke? Poke (pronounced “POH-keh”) is a classic Hawaiian appetizer that features sliced and marinated raw fish, served with a wide variety of accompaniments. Yes, that is possibly the vaguest definition ever, but considering “poke” is just a Hawaiian word meaning “to section, slice, or cut,” it makes sense that there are so many variations (you can get octopus, clam, or salmon poke). Still, if you’re eating this traditional raw-fish salad in Hawaii, you’ll most commonly find it made with yellowfin or bigeye tuna that’s been marinated in soy and sesame. 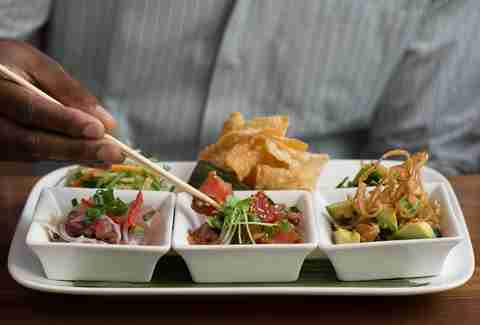 Poke is popular in Hawaii -- like, so popular that people refer to it as Hawaii’s hamburger. But the origin of poke actually dates back to the arrival of the first Hawaiians on the island chain, who cut up whatever fresh fish they caught that day and mixed it with salt and seaweed collected from the ocean. Although the dish has been around a very long time, the name “poke” didn’t become ubiquitous until the 1960s, and it wasn’t until the ‘70s that recipes for poke started appearing in cookbooks. If you visit Hawaii today, it would be almost impossible to go without eating poke at some point; the beloved dish (that’s often eaten as a snack) is everywhere. From a popular supermarket chain to a hole-in-the-wall seafood counter to a traditional luau to a casual family gathering on the beach, poke is one dish that Hawaiians hold as a true representation of their history and culture. Plus, it’s incredibly easy to make. All you need is fresh fish, a sharp knife, and a few ingredients for the marinade. Amani King/Courtesy of Hook Fish Co. So why is poke suddenly so popular stateside? Just a year or two ago, if you wanted poke in San Francisco, you had to really search for it. But now there are poke bars popping up everywhere, and it’s on the menu of quite a few sit-down restaurants, like Liholiho Yacht Club, Pacific Catch, and Michael Mina’s collaboration with Chef Ken Tominaga, The Ramen Bar. Beau Caillouette and Christian Morabito, founders of seafood catering business Hook Fish Co., echo Piscopo’s sentiments about the direct correlation of poke’s crave-ability to its popularity. Hook Fish Co. started as a backyard pop-up where Caillouette and Morabito put out ceramic bowls full of poke, as well as a couple of bowls of chips and invited 30 to 40 friends who paid by donation. Eventually they started serving poke burritos and tostadas, which were an even bigger hit. Their business took off, and they’ll open their first brick-and-mortar store and restaurant in the Outer Sunset this October. People will be able to buy poke and ceviche by the pound, seaweed salads, as well as a selection of rod-and-reel and hook-and-line caught seafood that can be cooked-to-order there. So why were these Southern California natives drawn to poke? First and foremost, they’re both surfers who feel a real connection to the ocean and want to educate consumers on where fish is coming from and who’s catching it. But they also just grew up eating poke and really, really like it. Caillouette says he loves that poke is fresh-tasting, but with a substantial saltiness. Morabito agrees about the awesome sweet and salty combination, but points out he also appreciates that poke doesn’t leave you with “a gut bomb” -- you can still surf or go for a bike ride after you eat it, which could definitely appeal to fit and active San Franciscans. Still, it’s surprising that poke -- the perfect dish for the California palate that focuses on fresh, local ingredients and bright, vibrant flavors -- hasn’t caught on sooner. But are stateside chefs co-opting this Hawaiian staple? Any time a dish that is native to one part of the world goes mainstream, it’s going to piss a few people off. In a piece for First We Feast Hawaiian chef Mark Noguchi wrote that while the poke trend is a good thing because puts Hawaiian cuisine in the spotlight, a poke bowl filled with unfamiliar ingredients can feel like appropriation. Caillouette and Morabito agree. “When it comes to poke, there’s room for creativity; there isn’t one way to make it over and over again,” Morabito says. But for them there is more to it. 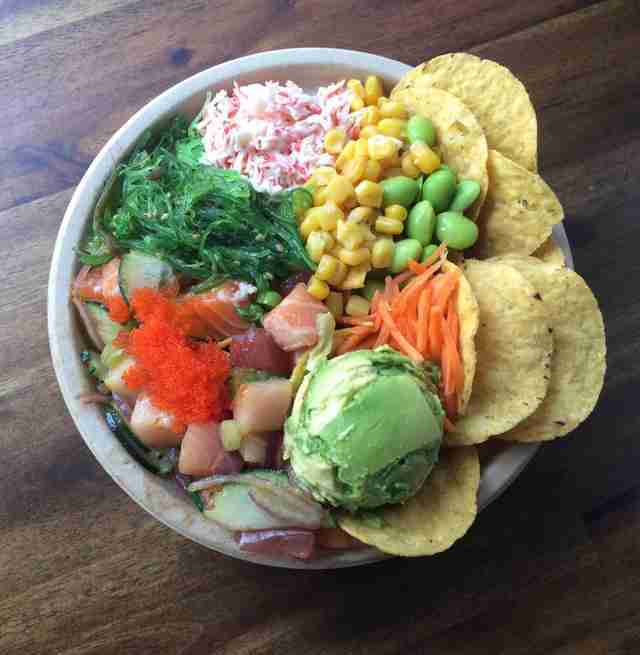 Here are five spots in San Francisco that we feel definitely do poke justice. The hero at this fast-casual collaboration between Chefs Ken Tominaga and Michael Mina is obviously ramen, but the selection of poke bowls are a great option for when you’re looking for something healthy, light, and filling. Choose from tuna, salmon, or octopus, all of which can be served over a mix or rice (brown or white) and salad or just salad. The tuna is incredibly popular, as is the poke trio, which is a mix of all three. The Hawaiian poke at this small Bay Area chain restaurant is real highlight. There are six different types to choose from, and it comes served with wonton crisps, seaweed salad, and daikon salad. Or just wonton crisps if too much salad isn’t your thing. The original (ahi tuna, sesame-soy marinade, and spicy seasonings) is our go-to when we want something healthy, tasty, and light, but we’re also fans of the indulgent macadamia nut or the serrano when we’re in the mood for a bit of a kick. This casual café is about to open two more locations in the Marina and Daly City, but for now the Inner Sunset location is the place to go for a satisfying poke bowl with tons of toppings. 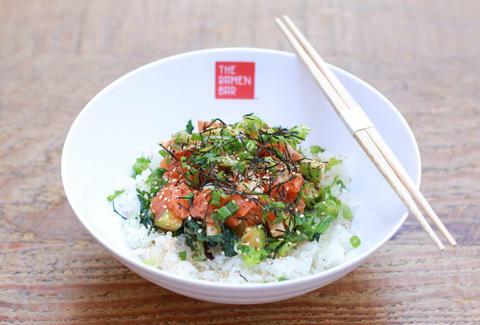 You start with a base (rice, mixed greens, kale, half and half), then pick your fish (salmon, tuna, yellowtail, crab meat), then choose a sauce (sesame shoyu, spicy mayo, ponzu, wasabi), and finally add your toppings, which range from edamame to onions to avocado to jalapeño. So... not your traditional poke, but still damn tasty and very affordable. 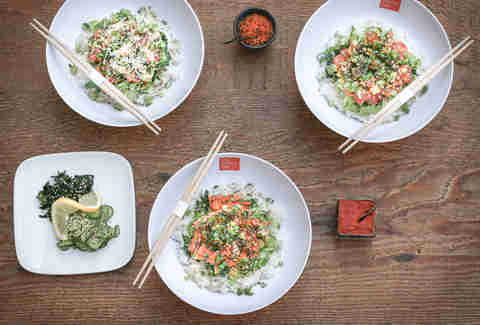 The focus at this casual Lower Pac Heights eatery is offering customizable poke bowls, but also serving fresh, sustainable fish, and taking care of the environment. Choose from house poke bowls or create your own with fish options like albacore, Arctic char, ahi, and octopus. There’s even a tofu options for vegetarians. 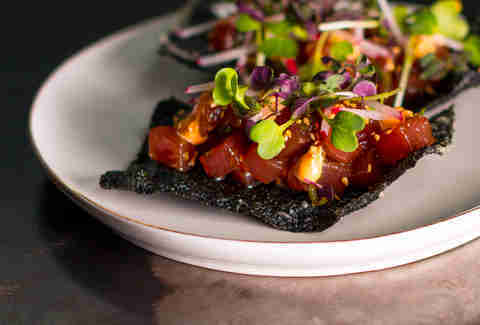 If there’s one dish everyone talks about at Liholiho, it’s the tuna poke with sesame oil and radish, served with a nori cracker. Chef Ravi Kapur is not serving up traditional Hawaiian fare by any means, but that’s the glory of eating at his restaurant. Everything is inventive and modern, but maintains the “Aloha Spirit” that’s so important to Kapur. And stay tuned for Hook Fish Co. opening soon in the Outer Sunset. Daisy Barringer is an SF-based writer who is always on the lookout for the next great food craze. Tell her what you think it will be on Twitter @daisy.